Redbird freshman Madie Baillon at the MVC Individual Championships last fall. Illinois State freshman tennis standout Madie Baillon is a bit impatient. Baillon’s Champaign high school didn’t have a tennis team, so she started one as a freshman–and then became a state qualifier three straight years. And she didn’t waste much time after joining the Redbirds; two weeks into the fall season, Baillon won a Missouri Valley Conference singles title. So it’s not a surprise that this impatience shapes how she plays on the court. “I like to hit the ball hard,” Baillon told STATEside. “I’d rather just rip it. I’d rather just go for the winner instead of the setup shot, even at times when I’m supposed to go for the setup shot. “That’s just how I am,” she said. 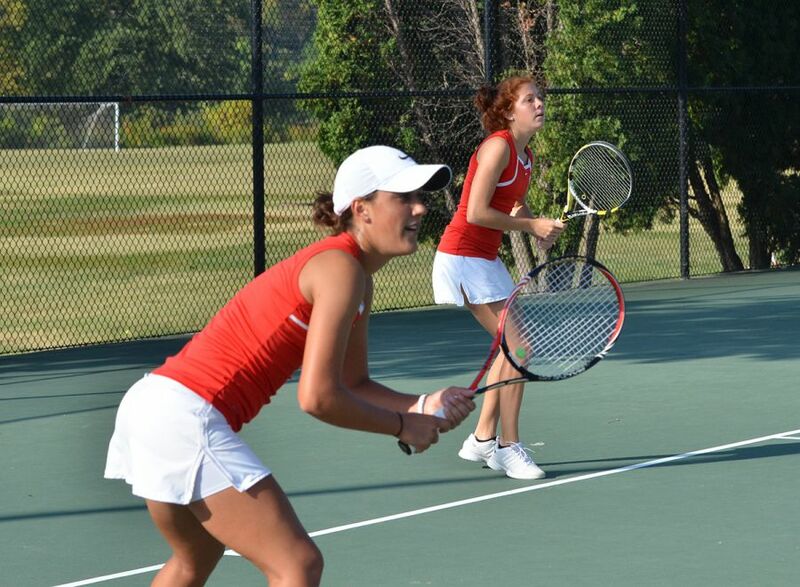 As the Redbird women’s spring season gets underway, Baillon is off to a strong start. In addition to her singles play, the freshman is paired up with senior Phyllis Tigges on Illinois State’s top doubles team. Baillon, an elementary education major, came to Illinois State from St. Thomas More High School in Champaign, where she was team captain all four years. Baillon fell in love with tennis as a kid and was coached by her father, Ernie, who played at the University of Illinois. It was dad who gave her advice about making the leap from high school to college play. Beyond the increased level of competition, tennis was going to play an even larger role in her daily life. 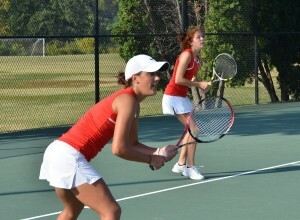 Madie Baillon, right, plays with Heather Nisbet in doubles last fall. Friendships with her Redbird teammates have also eased the adjustment. Her friend and fellow freshman Sierra Stone knows exactly what she’s going through, and she can turn to senior (and former doubles partner) Heather Nisbet for advice from an upperclassmen. Together, the team practices weekdays starting at 6:45 a.m., plus lifting and conditioning three days a week, and individual training. And that’s on top of any weekend tournament play. “It’s definitely a different college experience than most kids have, that’s what my dad told me,” Baillon said. There have been sacrifices–sleep and a traditional social life, among others. “But I don’t feel like I’m missing out, because all of my friends are here,” Baillon said during an interview at Bloomington-Normal’s Evergreen Racquet Club, where the Redbirds practice in the winter. Coach Chris Hoover recruited Baillon because of her doubles play, only to be surprised by her fast-developing singles skill during the fall season, including her title at the MVC Individual Championships in St. Louis in October. That win has given Baillon a confidence boost heading into the spring season, which culminates with the MVC Championships hosted at Illinois State in April. Hoover has recruited four previous Valley Freshman of the Year. With Baillon’s quickness, good hands, and ability to take coaching so well, Hoover said she has what it takes to be No. 5. “I thought we had (recruited) a good one, but she’s even better,” he said. Baillon knows that tennis will stay a part of her life no matter where she goes after graduation. Just like her father, she wants her own kids to play–either just for fun or all the way through college. The Illinois State women’s tennis team next heads to Indiana for a dual match weekend in Indianapolis, to take on the Indianapolis Greyhounds on Saturday and the Butler Bulldogs on Sunday. It must be amazing for Mr. Baillon to watch his daughter grow-up and become a college tennis player just like himself. I imaging Madie has made her parents very proud, especially during her leadership role for the Redbird's women's tennis team. Great story!